Philip Hammond’s warning of a Brexit “rollercoaster” ride was a clear admission of the uncertainty that Britain now faces. However, far from the Tory slogan of “an economy that works for everyone”, his speech offered a chaotic cocktail of vague promises and u-turns that work for no one. Even his Conservative colleague Nick Herbert has described the Cabinet Ministers in charge of Brexit as “three blind mice” stumbling around without a plan on how to quit the EU. Against a backdrop of a pound falling against the euro and the dollar – and a warning that a “hard” Brexit could cost 75,000 jobs, the Chancellor’s admission that Brexit could cause “turbulence” might be an alarming understatement. What businesses want to know is whether they will face new tariffs or regulatory barriers to trade with Europe. The Chancellor offered them no reassurances or gave them the slightest comfort that their concerns are a Government priority. His speech just reinforced the view there is a yawning void where there should be a coherent plan for trade in a post-Brexit world. It also exposed the hollowness of the Government’s non-existent industrial strategy and agenda to boost productivity. As expected, Hammond formally ditched his predecessor’s promise to get the economy back into surplus by 2020, confirming that there will still be a deficit after ten years of a Tory government. Yet, he refused to give the faintest clue about his plans for tackling the deficit or set out a framework for doing so. And his listing of the Government’s planned attempts to get our economy back on track did nothing to inspire confidence. The Chancellor promised to boost productivity, build more homes and close the “huge” skills gap with our competitors. The Government has already had six years to build more housing, yet home ownership is at it lowest level for 30 years. His re-heated announcement will do nothing to help those struggling to get on the housing ladder or cope with rocketing rents. The Chancellor also talked about increasing investment in transport and other infrastructure schemes. But there was barely a mention for the Northern Powerhouse or any details on these promised projects. And, what about the Government’s austerity cuts? Like so many other areas of his financial plans, we remain in the dark – even though previous cuts failed because they held back the economy. One rare exception to the Chancellor’s ill-defined blueprint was his commitment to continue cutting corporation tax from what he admitted was already a “highly competitive” rate of 20 per cent. The planned cut is just further evidence of this Government’s skewed sense of priorities. It is waste of money, that will just create an even bigger hole in the public finances, and the cuts so far have had no measurable impact on boosting productivity or investment. It is a misguided idea that should join the list of dumped policies. Similarly, the Chancellor should abandon the planned cut in inheritance tax and channel the savings towards creating a universal entitlement to childcare for all working parents of two-year-old children. That simple change would expand our workforce and make it easier for firms to recruit the talent they need. 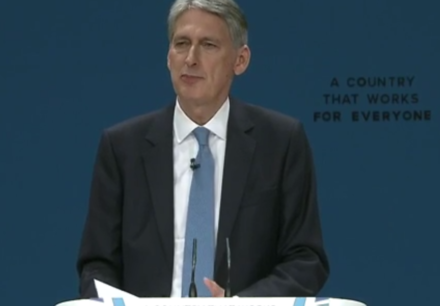 I agree with the Chancellor when he talked about “restoring fiscal discipline”. However, it will take more than the U-turns, vague promises and policy gaps that we saw in his speech to bring back confidence and stability. He has dumped George Osborne’s habit of wearing a hard hat and high-vis jacket on construction sites. He has also ditched his predecessor’s mantra of a “long-term economic plan” because it lacked any credibility. Sadly, the new Chancellor’s new approach is no more credible or reassuring. Ahead of his Autumn Statement, the Chancellor must do far more to flesh out key areas of his fiscal policy and how Britain will maintain links with our EU trading partners in a post-Brexit world. The lesson of the last six years is that we will never get our public finances under control unless we also build an economy that can deliver sustainable and broad-based growth in productivity, exports, wages and profits that our tax revenues rely on. It is time the Chancellor stopped talking about rollercoasters and turbulence and started outlining how he will end the uncertainty that we all face and restore stability to the economy. Rachel Reeves is MP for Leeds West and chair of the business, energy and industrial strategy select committee.